Anastasia started fencing when she was nine, because her dad thought it might be good for her. She soon became quite interested in the sport and started to show results. Her dad, Victor, wanted to have a better understanding of the sport, so he started to take lessons and join group classes himself, and soon he started sharing his daughter’s passion.Anastasia’s best result so far is when she earned her “A” rating in Atlanta during the 2010 Summer National Championships. She finished second in the cadet event. This result placed her on a different competitive platform which involved a few international cadet world cups in the current season (Poland, Germany, Great Britain, and Italy). 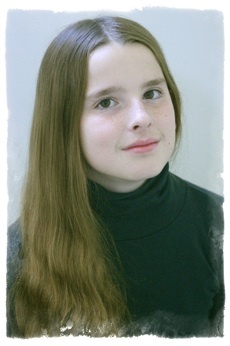 Although still a Youth 14 fencer Anastasia competes in cadet, junior and division I tournaments. So far she had a fantastic competitive season: she is ranked number one fencer in her age category (Y14), and medaled at both events junior and cadet at the 2011 Junior Olympic Championships. When she grows up Anastasia would like to become a singer or a computer animator, “That would be fun” she says.